Another completed project. 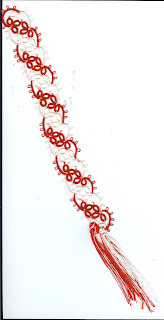 A red and white bookmark made from a pattern by Rita Weiss and this time I made no changes to the pattern. I did have a different thread in mind when I was starting this project but with all the shuttle switching I decided it would be better to use the two colors. It is the perfect color for Christmas. Now I can go back to making snowflakes.